Scott Quigg swiftly defended his WBA super-bantamweight title for the second time with a second-round knockout against Diego Silva in Manchester. 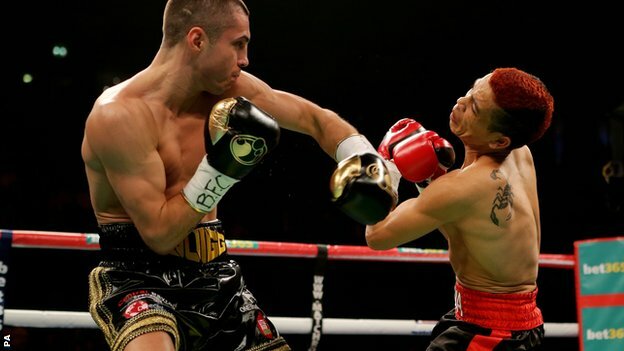 In his first world title defence in October, Quigg fought a majority draw against Cuba's Yoandris Salinas. But the 25-year-old from Bury floored Silva with a thumping right upper cut and sealed it with a right hook. "Fight by fight I'll grow into being a world champion and I think it proved I have gone up another level," he said. Quigg needed only one minute and 41 seconds of the second round to complete victory and extend his unbeaten professional record to 27 wins in 29 bouts with his 20th knockout. After the impressive upper cut, Quigg knocked Silva down for a second and final time with a vicious right hand that left the 30-year-old Argentine requiring medical attention. "I wanted to make a statement and prove I was a world champion in front of all of these fans, I wanted to show I had the punch power and the controlled reactions," said Quigg, after condemning Silva to a third defeat in 36 contests. "I enjoyed it in there, Silva was more aggressive. He was coming for me and I didn't have to go looking for him, if he was looking for a fight tonight he was going to find one and he was going to get hurt." The fight was the main undercard bout as Carl Froch retained his WBA and IBF super-middleweight titles with a controversial ninth-round stoppage of George Groves. Also on the bill at the Manchester Arena, Olympic champion Luke Campbell, who won his first three professional fights by knockout, jolted opponent Chuck Jones with a sharp left in the first round but had to settle for a points victory in his lightweight contest. And Stephen Smith claimed the WBC international silver super-featherweight title as he recorded an eighth-round knockout win against Sergio Medina.